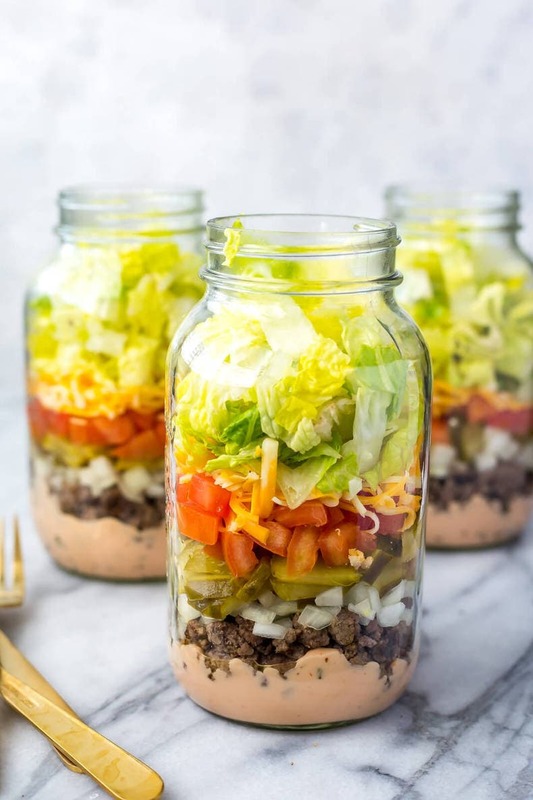 These Meal Prep Low Carb Big Mac Salad Jars are a delicious lunch option and a healthier way to satisfy your cheeseburger cravings - and the Big Mac dressing is easily made with pantry staples! Cook ground beef in a medium-sized skillet over med-high heat until fat has absorbed and beef is fully cooked, about 10 minutes. Meanwhile, mix Big Mac sauce ingredients together. Divide sauce among 4 mason jars. Top with ground beef, then layer with onions, pickles, tomatoes, cheese and lettuce. Store in the fridge up to 5 days - serve by dumping into a large bowl and enjoy!